Clear Mineral Oil Based Stainless Non Detergent Oil for Industrial Sewing Machines and Serger Oiler Refill, also Auto Oil Bath Lubrication Reservoirs in Oil Pan Under the Machine Head. Dyno Lily White (ISO-22) low viscosity crystal clear oil is a highly refined consistent viscosity and non-detergent mineral oil. Ideal for sewing and extile machinery and parts. Specially formulated for use in high speed sewing machines. Excellent for use in applications where the oil may come into contact with the fabric. Ships by Ground or ocean transport only. Considered Hazardous to ship by air. 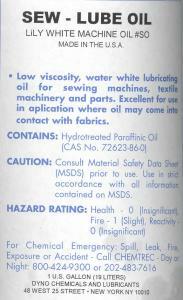 SEW - LUBE OIL, Lily White Machine Oil #SO, Made in U.S.A.
Low viscosity, water white lubricating oil for sewing machines, textile machinery and parts. Excellent for use in applications where oil may come in contact with fabrics. Caution: Consult Material Safety Data Sheet (MSDS) prior to use. Use in strict accordance with all information contained on MSDS. For Chemical Emergency: Spill, Leak, Fire Exposute or Accident - Call CHEMTREC - Day or Night 1 800-424-9300 or 202-483-7616. Mr. Douthat, My husband and I have shopped at AllBrands.com for years and every experience with your company has been great. We appreciate having a place to go where we can trust that the customer service and prices will be good and the products are what we ordered. Shipping is fast and products have arrived carefully packed. We appreciate AllBrands.com! Very pleased with everything. Highly recommend to other people. Look forward to doing more business with you. I bought oil for my industrial Juki. I had fear even finding a source, and you served me extremely well. Thanks!